The NVH App for Android and Apple iOS is Here! We worked with Allison Transmission to develop a quick, easy to use, accurate vibration diagnostic tool for the entire commercial truck and automotive industry. The result is NVH version 3.0 for Apple iOS Devices and NVH for Android devices!. NVH 3.0 for Apple iOS and Android devices includes 25 new features and enhancements. Select the button below to see all the new features. What is New in NVH 3.0? The Android and Apple iOS versions of the NVH app Include a database of over 14,350 vehicles from 30 vehicle manufacturers to choose from; just pick your vehicle and go! Can’t find your vehicle in the database? Not a problem! You can manually enter your vehicle’s information and save it for future use. Youtube, Facebook, and Twitter resources. Does your vehicle have a vibration problem? Our NVH apps take the guesswork out of diagnosing it! Works on compatible Smartphones and Tablets: See the Google Play or Apple App Store to check your device compatibility. Quick, Accurate , and Precise: The app can be setup and ready to begin diagnosis in as little as 30 seconds! Record while you drive: Record your road test and watch it again in real time or pause and go through it step by step. Automatic Diagnostics: Analyzes the road test recording and the primary source of the vibration on your vehicle. Totals: Displays the statistics for each type of vibration detected and will break it down by vehicle speed to give you even more information. Share: Email your recordings to another app user (Apple or Android) so they can view your road test results. ATTENTION ANDROID USERS: The Google Play Store restricts higher dollar App purchases on some accounts (especially new accounts) to prevent fraud. If you are unable to purchase our app on a new account, Call 1-855-836-3987, Select 1 for Apps and ask them to lift any purchasing restrictions on your account. This process can take up to 24 hours to complete. Turn your Smartphone or Tablet (with GPS) into an all-in-one Noise, Vibration, and Harshness (NVH) diagnostic tool! 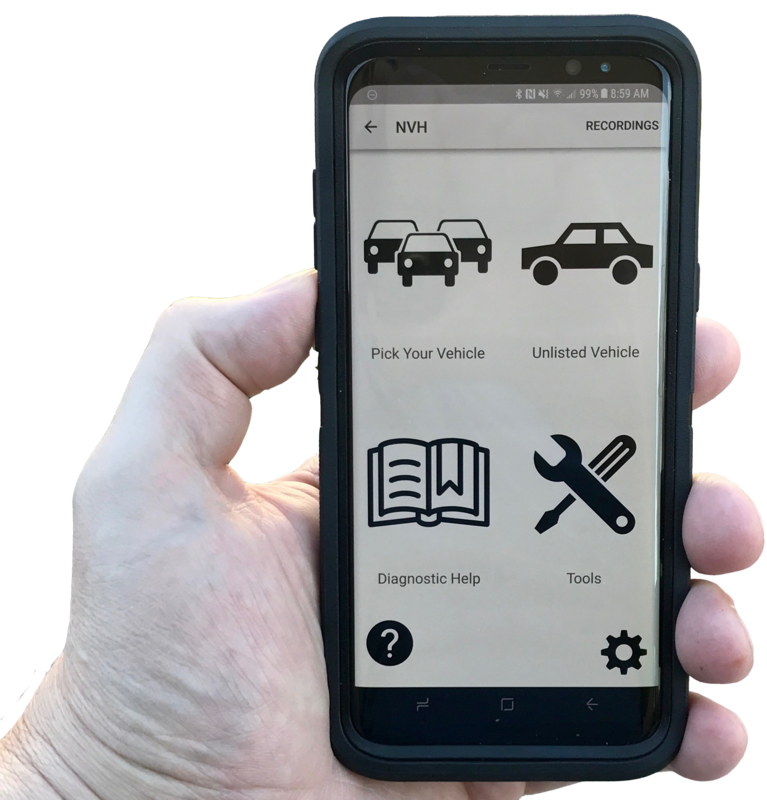 Purchase our new App to use the internal sensors of your device to diagnose automotive and HD truck vibration problems. The NVH App will identify the source of your vibration. Follow our context-sensitive diagnostic help file with solutions to nearly 300 vibration sources to locate and repair the problem. Auto Repair Shop Owner? Technician? Car Owner? Our App Can Solve Vehicle Repair Issues Faster And More Accurately! Your reputation with your customers and with local dealerships must stay on the positive end for your mechanic’s shop to survive. What if you could solve vibration issues faster and more accurately saving you time and increasing your customer satisfaction? Have you been avoiding repairs because they have to deal with vibration? What if there was a simple solution that could not only pinpoint the source of vibration but also give you all of the possible solutions to fix the issues with the vehicle? Have you been frustrated when you know there is something wrong with your car or truck, but your dealership or mechanic never seems to fully solve the issue? Are you worried about your vehicle’s value and the safety of yourself and your family? Faster Testing - Accurate Diagnosis - Complete Repair Solutions. We are here for you. Tell us about the vehicle you want to test. Don't See Yours? What Type Of Vehicle Do You Want To Test?